"A blackly funny examination of the whole Death business, with more than a few wise observations about the whole living thing as well. A Catch-22 for the afterlife which will tell you everything you ever wanted to know about Death. Should be made required reading for dead people." "[The Apprentice] creates the happy effect of never hearing the same chord progression twice. It's amazingly easy to keep on reading, as the stories shift from naturalistic to philosophic to surreal. All of them are welcoming, and each invites the reader to participate in the act of discovery, not out of obsession or false intimacy, but through a free-flowing generosity that engages not only the heart but the mind." "Tired of the same old novels and authors? Fed up at how no one seems to have an original take on anything any more? Given up on finding an inspiring and entertaining novel? Well you need to read Gordon Houghton's The Apprentice, one of the most original and blackly funny novels I have enjoyed in a long while... [It] is the sort of novel that you stumble across every so often that is so original that it screams out to be recommended. I can see it as a TV drama, or as a film. Houghton has managed to tread the line between horror, satire and humour so well that the book works as all three, in a seemingly effortless mix of excellent characters and intriguing situations. It's a brilliant book, one of the best handlings of undead life that I have seen, and one which I heartily recommend." "Part mystery, part tragic love story and part comic corpse-coming-of-age story, Damned if You Do succeeds expertly in each area it attempts, managing to provoke tears, grins and more than a few episodes of heart-sinking dread. The storyline itself pretends to be simple but isn't at all; in fact, many times the point that you think Houghton is trying to make isn't what you wind up with... Along the way we are treated to some deliciously disturbing slapstick, a few horrific passages that would make Stephen King blush (the chapter centering on asphyxiation is especially harrowing) and some surprisingly insightful ruminations on the nature of loveand the absolute devastation inflicted on human hearts caught up in a love gone wrong... Gordon Houghton has created a rare bird with Damned if You Do. Monty Python meets Clive Barker meets Oscar Wildean unlikely matching of literary bedfellows that compliment rather than compete. 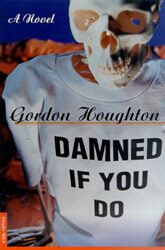 Wildly imaginative and deeply insightful, Damned if You Do is a true gem." Louis Maistros, author of The Big Punch. Read the full review here. "This is a book full of dark humour and darker deeds. So sharply observed one assumes it was written with a scythe rather than a pen... With tongue firmly in cheek (or jawbone) Houghton brilliantly succeeds in bringing life to death and death to life." "'I had been dead for countless years when I heard a knock on the coffin lid.' is the opening line of this witty, mad, ultimately touching book that comes at the reader from all directions and never lets up. Gordon Houghton writes like a really good flamenco guitaristfast, full of fevered flourishes and memorable phrases throughout." "Take yourself out to lunch armed with this book; take the afternoon off; kill a weekend with these pages. Your time can't be better spent. Damned If You Do deserves it... Life is short, art is long, and death is funny. But think twice about the slice of green pie in the fridge." "Houghton's greatest accomplishment is endearing his narrator to the reader through many similar fears and concernslove, honesty and the importance of how you've lived your life... The premise of the book screams "movie-ready," but thankfully Houghton imbues it with a fuller, and sometimes bleaker, realization of the places this story can go. The result is a quirky and intriguing look at the sadly comedic possibility that the daily pains of life aren't a hell of a lot better when we're six feet under." "Gordon Houghton's second novel, The Apprentice, is such a pleasure to read... Death will never seem quite so grim again." "A hip, modern spin on the tried-and-tested It's A Wonderful Life back-from-the-dead allegory." "...a comic style reminiscent of both Nick Hornby and Monty Python." "A brash and often gruesomely funny debut novel ... The author gets points for audacity, and for reinventing the Four Horsemen as a perpetual vaudeville act." "Houghton's tale combines the wit of Neil Gaiman with the wry observations of Douglas Adams." "Wacky, pointed, sinister and satirical, [the book] moves at a brisk, grisly pace... Though Houghton's first novel, The Dinner Party, has not been published in the US, his sharp observations and spare, colorful prose make him a writer to watch." "This book is funny, touching, gruesome, and just plain weird, all at the same time... a fun way to kill some time and get a good story under your belt." "The writing is darkly humorous... Houghton has the same dry, dark humor that Neil Gaiman displays in Good Omens. The book moves along nicely with quick interludes between the sorrowful past and the deadly present." "Dieses Buch hat alles was man von guter, leichter und unterhaltsamer aber nicht oberflächlicher Lektüre erwartet. Der Protagonist schildert seine Erebnisse so ausführlich und mit soviel Sarkasmus... man erfährt, wie es ist, ein Zombie zu sein. Gleichzeitig leidet man mit ihm, wenn er an sein Leben zurückdenkt und ihm schließlich wieder einfällt, wie er gestorben ist..."